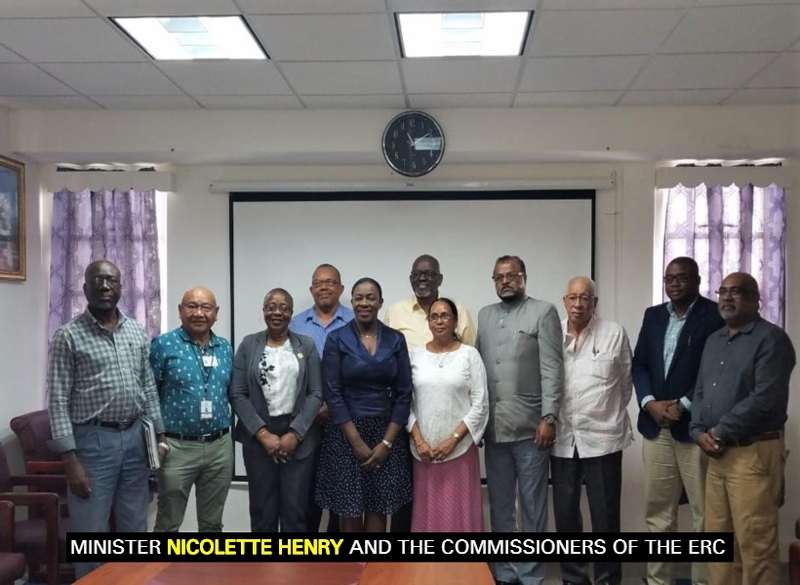 The Commissioners of the Ethnic Relations Commission (ERC) today met with Minister of Education, Nicolette Henry, to discuss how the two can collaborate to advance the work of the ERC. Chairman of the ERC, Dr. John Smith highlighted the importance of the education sector, describing it as that branch that is a key component that interacts with everyone. He said that the ERC believes that working hand-in-hand with the Ministry of Education can achieve positive change in society. During the discourse, the ERC had presented a number of areas and projects that can be undertaken by both entities. These include printing of a Guyana Text, Harmony Studies in schools, Essay Writing Competitions and Harmony Clubs. Minister Henry welcomed the suggestions and noted that the Education Ministry may have suggestions on how to tweak the ideas so that they meet best practices. She said that the engagement with the ERC has come at an opportune time when the Ministry of Education is undergoing extensive curriculum reform and is in the process of conducting consultations. According to the Education Minister, her Ministry can facilitate a meeting with the experts working on the curriculum reform process and the ERC so that the Commission can be apprised as to what is happening and to make contributions. Further, Minister Henry said that the ERC can also be given the opportunity to contribute towards the Ministry’s Strategic Plan 2019-2030 which is currently in the planning stage. Moreover, to address some of the many issues in society that fall under the radar of the ERC, Minister Henry made the call that the school system should be used to engage parents in a large way since most of the learned behaviour by children are not influenced in the school system. It was the consensus of all present that by targeting the youth population, there will be a greater impact to engender positive change in society. It was agreed that moving forward, the ERC will engage officers within the Ministry to establish a working committee that will look at how the concerns and interests of the ERC can be addressed through the education sector.